Oediceroides emarginatus, photographed by Gauthier Chapelle. I've been out in the field for a couple of weeks, hence the momentary absence of regular posts. But I have returned, and shall kick off with a brief introduction to the Oedicerotidae. 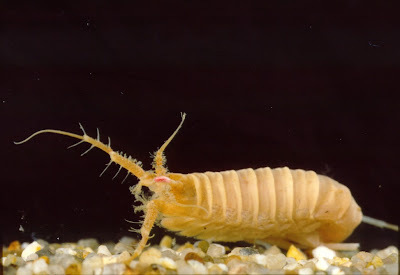 The oedicerotids are another cluster within the systematic morass that is the gammaridean amphipods (other gammaridean families featured here and here). Members of the Oedicerotidae are marine benthic burrowing forms, appropriately solidly built (for an amphipod, at least), and most readily distinguished from most other gammarideans by their particularly long fifth pereiopods (the last pair of legs on the main body) (Barnard 1969). They also usually have a long peduncle on the third uropods (the 'tail' appendages), though one distinctive genus Metoediceros lacks the third uropod entirely (Barnard 1974). In many oedicerotids, the eyes have also moved upwards to become coalesced along the dorsal midline and the head often possesses a prominent rostrum. However, these features are absent from a number of Southern Hemisphere and deep-sea taxa (the latter of which generally lack eyes altogether). Dorsal view of the head of Monoculodes borealis, showing the coalescent eyes, from Andrey Vedenin. Oedicerotids of the genus Synchelidium have been shown to be predators of harpacticoid copepods (Yu & Suh 2006). The abundance of this food appears to determine their reproductive behaviour, as females produce larger broods in the spring when harpacticoids are more abundant than in the fall. Barnard, J. L. 1969. The families and genera of marine gammaridean Amphipoda. United States National Museum Bulletin 271: 1-535. Barnard, J. L. 1974. 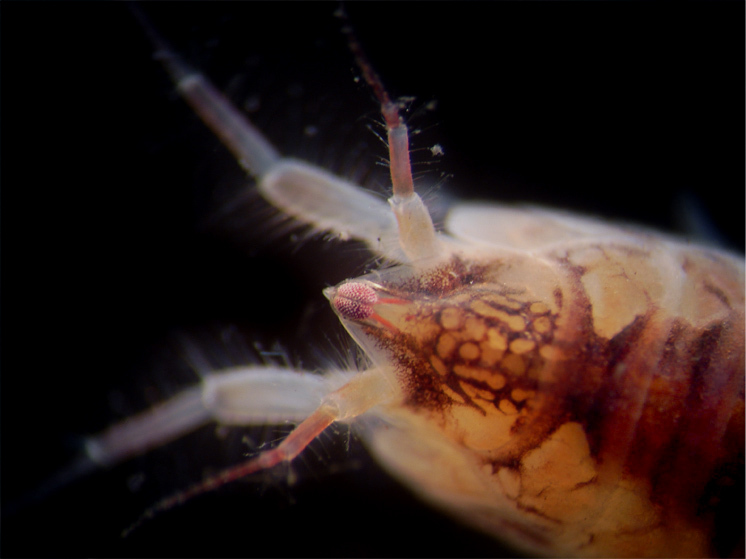 Evolutionary patterns in gammaridean Amphipoda. Crustaceana 27 (2): 137-146. Yu, O. H., & H.-L. Suh. 2006. Life history and reproduction of the amphipod Synchelidium trioostegitum (Crustacea, Oedicerotidae) on a sandy shore in Korea. Marine Biology 150: 141-148.